Gabe Levin averaged 11.1 points and 7.1 rebounds for Loyola Marymount this past season as a freshman. Loyola Marymount’s Gabe Levin is transferring to Marquette, the school announced Tuesday. Earlier in the day both Levin and his former high school tweeted the 6-foot-7 forward will join the Golden Eagles. Levin will have to sit out the 2014-15 season due to NCAA transfer rules but will still have three years of eligibility remaining. 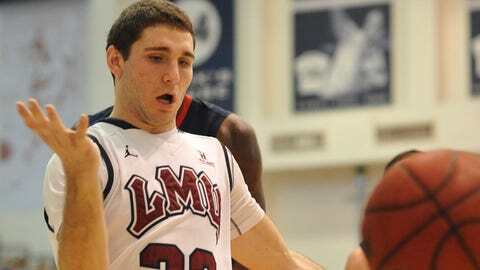 Starting 29 games for LMU as a freshman in 2013-14, Levin averaged 11.1 points and 7.1 rebounds per game. The school replaced head coach Max Good with Mike Dunlap, causing Levin to announce his intention to transfer in May. "Gabe’s versatility and toughness will allow him to make an immediate impact on our program," Marquette head coach Steve Wojciechowski said in a statement. "He has already proven his ability to produce at a high level and we are extremely excited about his addition to the Marquette family." Levin, a native of Oak Park, Ill., narrowed down his options to Marquette, Notre Dame and Northwestern and visited the three schools earlier this month. The Oak Park-River Forest High School basketball team account tweeted, "Congrats to @Gabe_Levin_3ABM (Gabe Levin 2012) makes it official and transfers from @LMULions to @MarquetteMBB @BIGEAST #watchout"
Marquette coach Steve Wojciechowski has now landed two transfers since taking over in April, as BYU guard Matt Carlino will take advantage of the NCAA’s graduate student transfer rule to play immediately for the Golden Eagles in 2014-15.